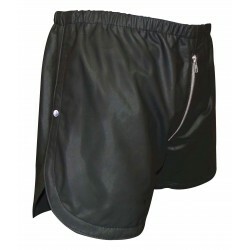 Black Leather Shorts with 2 Zips Front and Back, This Shorts Made From Real Sheep Nappa Leather. 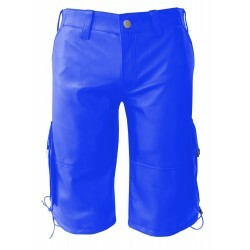 These leather shorts are extremely comfortable with the addition of elasticated waist with Front and back Zip. 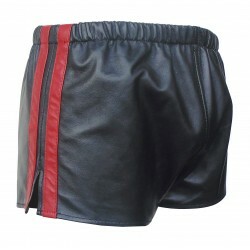 This product is made from high quality leather. Most of our items can however be made in different colours and sizes. please do not hesitate to contact me if you have a special requirement as i am always happy to assist. 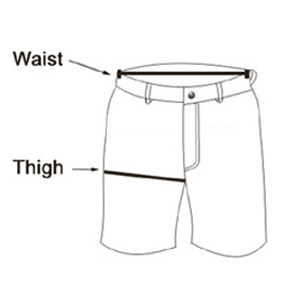 This Shorts Made From Real Sheep Nappa Leather. 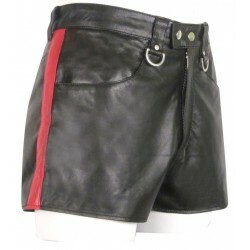 Leather Shorts - These leather shorts are extremely comfortable and good wearing, also they have a more versatile usage as they have a more fashion look than a sole fetish design. Every man needs both a thong and jock in their collection. This thong incorporates spiky stud work to attract the attention of your many suitors. Revel in the sensual feeling that this pouched thong creates. It comes with a thong strap running underneath in real leather. Men's Leather Adjustable Harness With Chain in Black This product is made from Sheep Nappa Leather. This is your opportunity to own a unique thong. Let us introduce you to our Leather Elastic Fabric Thong. This thong is for the leather stud who wants to change up his look and grab the attention of a crowd.